Was anyone asking for this? Not really. Are you a little curious what it tastes like? Probably. Planters has announced a collaboration with Noon Whistle Brewing out of Lombard, Illinois. The beer, which is begging to be talked about exclusively in puns, is called Mr. IPA-Nut. It's Planters' first foray into the world of craft beer. While it feels like a stunt beer -- something increasingly familiar with the recent release of beers from Dunkin' Donuts and IHOP -- peanuts and beer go together like, well, uh, salty things and beer. It's a good combo, and the salty flavor comes across in the brew. 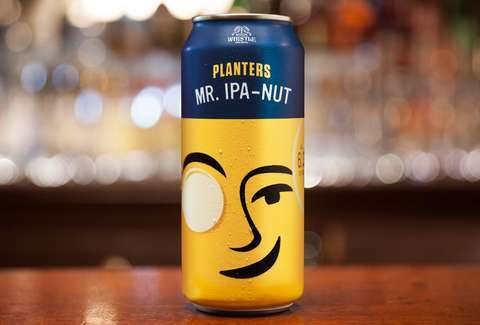 "Mr. IPA-Nut has a unique citrus aroma with a hint of honey-roasted peanuts followed by a slightly salty finish," says Ashley Tople, marketing director for Planters. "It would have been easy to make a great stout or porter with nuts, but Planters wanted to prove that nuts go great with any style beer," Michael Condon, owner of Noon Whistle, said in a statement. "We took their Honey Roasted Peanuts and made a great IPA that highlights both hops and peanuts." Condon is probably right about a stout or porter being a logical choice, but it's a stunt that invites curiosity nonetheless. Unfortunutely, you can only pick up a four-pack of the nutty combination at select stores in Illinois and the Noon Whistle brewery starting on October 27.